Our curriculum is based on the principle that children construct their understanding of the world around them from their own active interactions with people, materials, and ideas. The curriculum encourages both the teacher and the child to initiate learning experiences; therefore, daily activities are not just created by the teacher, but also from the child’s interest and ideas. 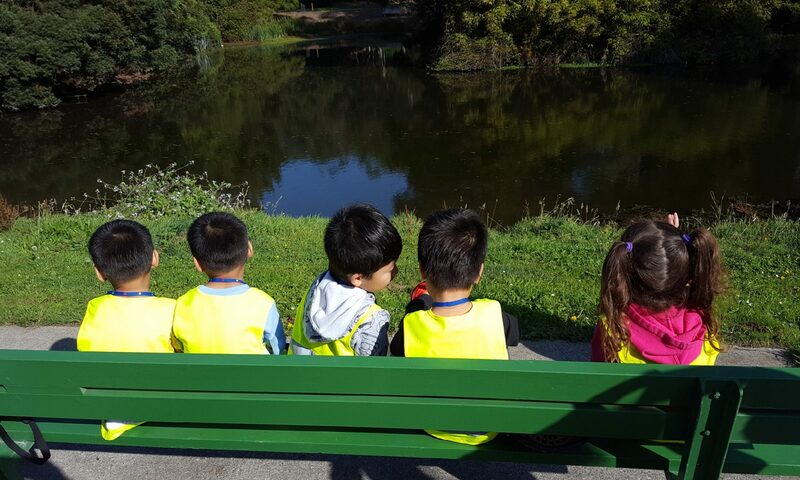 Language: Our program includes two Mixed Age Groups that are separated by a primary language – Mandarin or Cantonese. Our classroom is setup to support awareness of both Chinese and English culture with focus on the areas below. Social Emotional Development: Developing self awareness of others and learning how to interact cooperatively during play. Taking turns, playing together, helping one another, working together, and accepting each other’s differences will also be emphasized. Reading: Becoming familiar with books, print, and letters, writing one’s name, developing good listening habits, learning to sequence and retell details, and classifying pictures are a part of your child’s reading readiness. Mathematics: Matching, comparing, sequencing, ordering, grouping, counting, recognizing and writing numbers, measurement, weights, shapes, and time (calendar) are some of the concepts covered in the math readiness program. Language Development: Identifying common objects in both English and Chinese, finger plays, creative dramatics, rhymes and riddles, puppet plays, listening to stories and folk tales are an integral part of the oral language development program. In addition, we encourage children to articulate their own experiences and create their own stories. Social Studies/Multicultural Education: The self-image of the child and his/her immediate world–the family, the home, the neighborhood–are important. TSS will present books, stories, and toys from a variety of cultures in a non-stereotyped framework. Physical Development: A variety of games, relays, body movement activities to music, and free play with physical materials which help develop fine motor and gross motor skills as well as train eye-hand coordination are some of the daily physical activities. Science: Insects, birds, animals, and plants that we see around our school, community, and city will be the primary focus of the science program. The science program focuses on ecology and hands-on experimentation. Children will explore the weather, space, air, water, and so forth. Music: The school teaches a wide variety of songs in both English and Chinese. The children will also be exposed to a wide variety of musical instruments from many countries.